At first glance, Jeep’s latest promotional giveaways might not seem that ground-breaking. It’s an automotive brand handing out custom carabiners. So what? Well, the carabiners have a great creative twist – they’re shaped like Jeeps. We love it when brands create custom products, and carabiners for Jeep fit the brand perfectly. Here’s a look at the promo. It unfolded in Moscow, where the legendary SUV brand wanted to entice extreme sports enthusiasts to take a test drive in Jeep Territory, an off-road testing ground. Jeep distributed the promotional giveaways – which were embossed with the line, “There’s an easier way to get there” – to customers who made a purchase at various travel gear stores. During the first week of the promotion, 5,000 carabiners were distributed. Almost 1,000 brought in their card and carabiners for a test drive. Great promotions don’t just happen – they take careful planning and a thoughtful execution. Here’s why this promotion was a success. 1. Jeep understood its target audience. Understanding who you want to reach with your promotion is a critical first step. Jeep took the time to think about its target market, where these potential customers could be reached, and what kind of promotional giveaways they would find useful. 2. The giveaways served two purposes. The primary reason for handing out the custom carabiners was to get prospective buyers to complete a test drive. But the promos are also tangible reminders of the Jeep brand, and they’re items that recipients will likely use when they’re out exploring the great outdoors. Jeep gets long-lasting exposure as a result. 3. The carabiners were different from the usual giveaway. 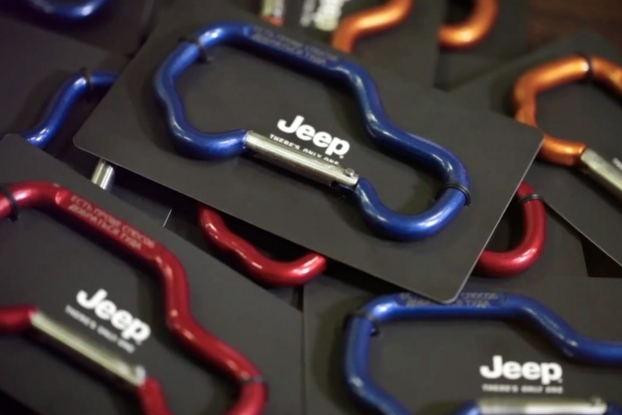 Jeep kicked up the promotion a notch by using carabiners in the iconic Jeep shape. There’s nothing standard or generic about these promotional giveaways – they’re distinctly Jeep. When you want to get people excited about your promo, give them items that are immediately recognizable as belonging to your brand. Jeep’s promotion wasn’t a huge global campaign – it was just the opposite. It was a highly targeted direct-marketing campaign that creatively put the Jeep brand in front of a narrowly defined target audience. Jeep was successful in getting prospective buyers out to test drive its vehicles, and it also put a useful, distinctive promotional item right into their hands. This promotion was effective because Jeep knew who it wanted to reach, and it got in front of its audience in a creative, standout way. Have you ever developed custom-designed promotional giveaways for your brand? Tell us about it!